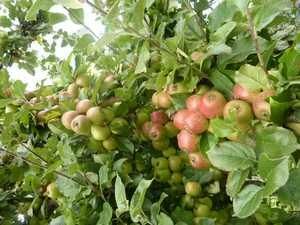 Court Royal - Cider Apple Tree £12.75 - Cider Apples - Sweet Apple Trees and Fruit Trees For Sale. Buy at competitive prices with wholesale discounts. Court Royal is a pure sweet cider apple, found in many old orchards through Somerset and East Devon, where it is often known as Sweet Blenheim and Pound Apple. It is a triploid and so trees are large, vigorous and spreading with regular heavy crops. The apples, originally sold as dessert fruit, are large, sweet and crisp and its fast fermenting juice makes a strong, pure sweet vintage cider.